*Barack Obama’s presidential campaign has been turned into a musical and will premiere this week in Germany, the Associated Press reports. The production includes love songs by the president to his wife Michelle, duets with his former Democratic rival Hillary Clinton and even actors portraying the losing Republican candidates John McCain and Sarah Palin. 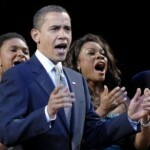 In all, 30 singers, actors and dancers are to perform in the musical “Hope — the Obama Musical Story” when it opens at the Jahrhunderthalle concert hall in Frankfurt in a bilingual mix of English and German. 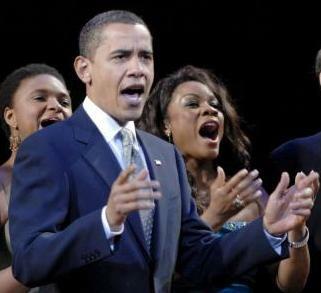 Many songs quote from the politicians’ stump speeches during the 2008 U.S. presidential campaign. Set in Obama’s hometown of Chicago and viewed through the eyes of a group of people who share an apartment, the musical tries to show how Obama’s campaign gave people at the time hope for change and belief in a better future. “The story starts 20 years ago, when Obama worked as a community organizer in Chicago, and leads all the way to the 2008 campaign,” said Wilson. Most of the actors are American and many have performed in other German musicals. The organizers of “Hope!” said that tickets are only available for the opening night in Frankfurt and that further performances there and in other German cities were still being planned.